This Spring, we have decided to do something a little bit different! 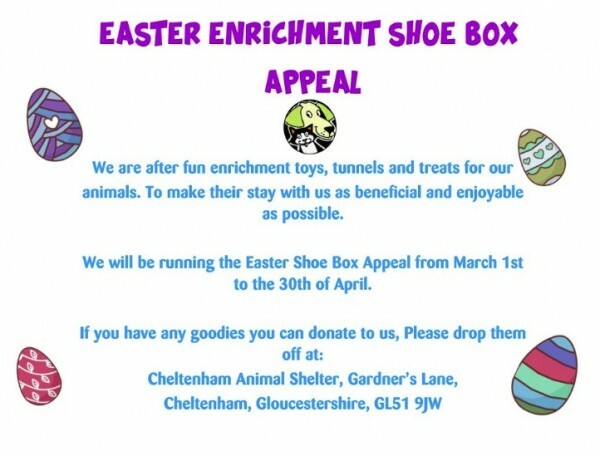 Due to the success of our Christmas Shoe Box Appeal, we asking again for the generosity of the public in supporting our Easter Enrichment Shoe Box Appeal. What do we mean by Enrichment, what can you donate to help support us? We are looking to better the lives of ALL the animals here at the shelter. That includes their kennel, cat pod and hutch enrichment! So we are asking for donations of toys, tunnels, good quality large harnesses, slow feeders and anything fun, that maybe you know your pet enjoys playing with! What do our Cats need? For our Cats we are looking for donations of cat nip toys, scratching posts, feather teasers and interactive to keep them entertained throughout their time with us. What do our Dogs need? Our Dogs are hoping to be able to play with their food, using slow feeders! Dogs need to be kept entertained to avoid destructive behaviour in the kennel and in the home, with your help we are hoping to provide them with puzzle games, scent toys, chew toys, rope toys, tennis balls and anything that you think our dogs will love! What do our Small Animals need? All animals big and small need to have entertainment to keep them busy! Our bunnies, guinea pigs, rats, mice, hamsters, gerbils and other small animals need to have access to tunnels, treat toys, swings and outdoor play toys to keep them busy! Based in the heart of Gloucestershire, we rescue and re-home unwanted and abandoned stray cats, dogs and small animals.